To augment the damage, taxes also have been increasing. The feckless Gordon Brown of the Labor Party boosted the top tax rate to 50 percent (a disaster from a Laffer-Curve perspective) before getting evicted by voters. The Tory-Lib Dem coalition is similarly bad. In recent years, the capital gains tax has been increased (see these amusing posters to understand why this was a foolish idea), along with a big hike in the value-added tax (though, to be fair, the corporate rate has been slightly reduced and part of Gordon Brown’s higher income tax rate has been repealed). But the Tories and Lib Dems aren’t through with their assault on the economy’s productive sector. Both Prime Minster David Cameron and one of his deputies have argued that people have a moral obligation to turn more of their income over to the government. And now the leader of the Lib Dems, Nick Clegg, is proposing a wealth tax. He says it will be a temporary measure until the fiscal emergency ends, but I would be shocked if politicians changed its mind after getting their hands on a new source of revenue (just look, for instance, how British politicians went crazy after first imposing an airline ticket tax). Here are some illuminating excerpts from a column in the UK-based Telegraph. …from what can be gleaned, the Deputy Prime Minister seemed to be suggesting a one-off or short term tax hike rather than a permanent change in the way the wealthiest are taxed. He described it as a “time limited contribution” to the “national effort” – since it was becoming clear, he said, that the country was embarked not on a “short economic battle” but a “longer economic war”. 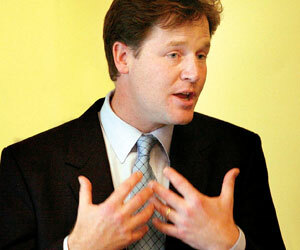 Mr Clegg said it would be “people of considerable wealth” who would be asked to make such a contribution. It doesn’t appear that this plan will get the necessary support from the Tories, but it’s remarkable that it has been proposed. Like the death tax, the wealth tax is a turbo-charged form of double taxation. P.S. One of the leading Lib Dem politicians got caught dodging taxes, making him the British version of America’s tax-cheating Treasury Secretary. I generally don’t object when people try to protect their income from greedy and incompetent government, but when they also are the same people proposing higher taxes on everyone else, they deserve special scorn. P.P.S. This post is describing the current dismal fiscal situation, but the title references “a miserable and hopeless fiscal outlook.” That’s because I see no hope of good fiscal policy in the remaining years of the current government, and I suspect the statist failures of the Tory-Lib Dem coalition government will pave the way for a new Labor Party government. Needless to say, that will be – at best – jumping from one frying pan to another. Incidentally, I’m also worried about the United States for the same reason. Tax the things you want less of. Guess England wants fewer wealthy people. Curious.